According to Custora, "E-mail marketing was the leading channel behind search, driving 20% of online sales in the 2015 holiday shopping season". This means that every fifth online purchase was completed due to effective email marketing. Sounds impressive, right? Make sure you get the most out of email greetings. An E-card is a good way to reach the ultimate number of customers and boost your sales during the holiday season. To avoid sending pointless holiday newsletters read our list of the Do’s and Don’ts of holiday greeting emails. The end of December is not the first time when the holiday mood enters the minds of consumers. In 2015, more than 40% of consumers purchased their first Christmas gifts already in November (National Retail Federation). To keep up with this trend, start sending holiday newsletters as early as possible. Black Friday is a good way to kick off Christmas sales. In 2016, it takes place on the 25th of November. 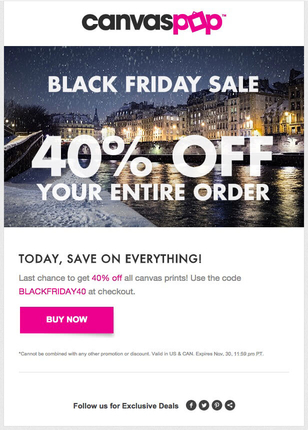 Image: Canvas Pop gives 40% off all products on Black Friday. Many businesses are fighting for your customers’ attention during the holidays. You need to come up with creative ideas to get your emails noticed. Put emphasis on outstanding design and appeal to the season's spirit in your e-greeting. Run a cheerful competition with a sweet prize. This will drive engagement and make your email memorable. 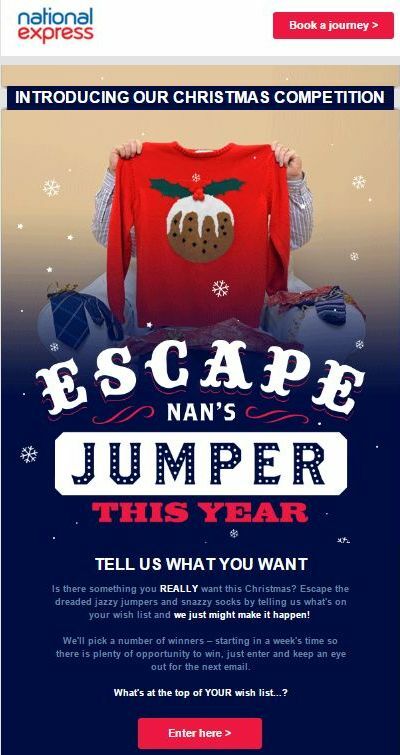 Image: A Christmas competition run by National Express. Aside from design, your seasonal greetings should have catchy content to make its reading a worthwhile experience. 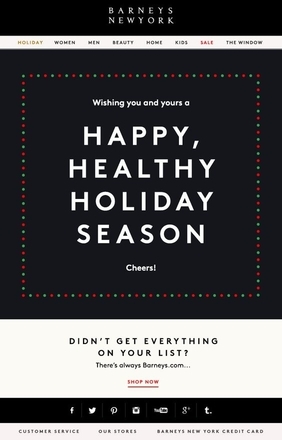 Your customers receive tons of e-greetings from relatives, co-workers, friends, not to even mention your rivals. Make your content stand out to ensure a longer attention span. Be helpful: everyone is really busy around Christmas time. Provide easy and customized solutions, such as "The top 10 gifts for her". Image: Brooks Brothers’ Christmas newsletter contains festive ideas on gifts ‘for him’. Offer a gift card or a discount coupon in your greeting email. By doing this, you will kill two birds with one stone – let the customers know you take care of them and attract more webstore visitors. Keep in mind that customers are especially vulnerable towards the quality of delivery during the holidays as stores are overwhelmed with orders. Providing a discount alone may not be enough to increase sales. To stay ahead of competitors, represent your store as a reliable vendor. Find out what the last day for guaranteed delivery before Christmas is and specify it in the letter. Another option is to add SMS reminders of delivery dates (for example, "10 days left to get your Christmas gifts on time"). Image: A 30% discount and free shipping during Christmas provided by J. Crew Factory. The recipient is informed that there are only 3 days left for delivery by 24th of December. Christmas is not celebrated by all nationalities around the globe. Make sure you are tolerant to different cultures, especially when dealing with international markets. Try using a more neutral text, such as "Season's Greetings" instead of "Merry X-mas". 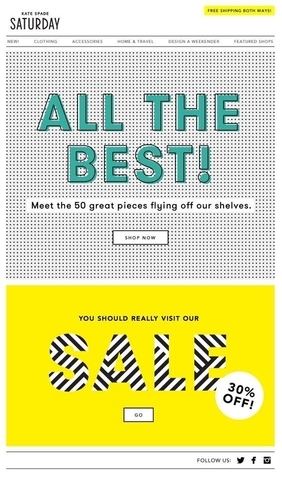 Image: The newsletter of Barneys New York will cater to customers with different beliefs and traditions. Some customers tend to postpone presents' preparation until the last day. Their orders might not be delivered by the time they should be put under a Christmas tree. Prepare a printable discount voucher or a gift card attached to the order confirmation email. This way, a buyer will have a small gift for the loved ones in case of a shipping delay. Set the countdown in an e-greeting to remind last-minute decision-makers how many days are left until the Big Day. 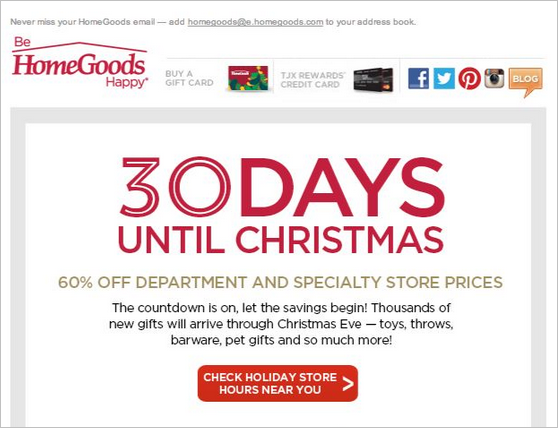 Image: The countdown used in HomeGoods newsletter may trigger a customer to visit a webstore right now. A large percentage of recipients will read the email greetings on their smartphones. Mobile open rates increase as people become busier during Christmas time. Design responsive e-cards to make it pleasant to read for any user. Make a clear Call-To-Action button to allow a customer to start shopping straight from a mobile device. Image: A mobile version of Kate Spade Saturday e-card encourages to start purchasing right away. Even though the holiday time is over you should ensure that shopping at your store is possible at any day of the year. Send holiday newsletters at some point after Christmas time to let a client know you are always around. Create special 'post sales' to drive revenue even after Christmas season. 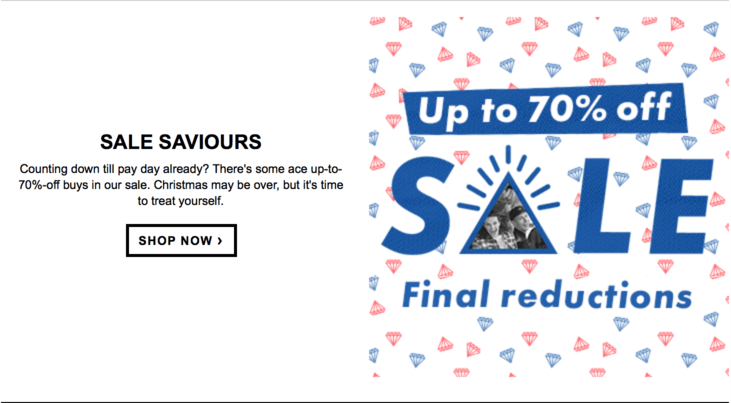 Image: ASOS provides up to 70% discount despite holidays being over. Need help in creating holiday newsletters for your clients, colleagues and stakeholders? With Liana Mailer, you can create incredible Christmas E-cards, which will be delivered in time and to all recipients regardless of their location and type of device. Contact us to learn more about Liana Mailer or to broaden your horizons in email marketing.